Wearable baby carriers have become increasingly popular, especially with Instagram moms like Chrissy Tiegan (@chrissytiegan) sharing glowing baby wearing photos. Even celebrity dads, like Mr. 007 himself, Daniel Craig, have been seen in the media with harnessed baby in tow. Baby wearing has been a parenting practice for centuries through various cultures around the globe. Modern baby carriers bring this practice into a new era with ergonomic sciences to offer a premium parenting tool for busy, on-the-go moms and dads. Baby wearing devices may be best left off the registry and purchased after the child is born as body size and other variable factors (such as premature birth) can impact carrier selection. When choosing a baby carrier, parents will make considerations both for their own body size as well as their baby’s age and weight. There are many baby carrier models available in stores and online. Most carriers fall into one of four categories: Ring Slings, Wraps, Soft Structure, and Solid Structure. There are few exceptions, like Mei-Tai carriers, which are like a cross between a wrap and a soft structure carrier. Ring slings are soft-fabric carriers, typically worn diagonally across the parent’s body. The baby is carefully cradled in the front or on the hip (for older children). Pros: Ring slings are usually the easiest devices to wear and remove. The fabrics used are generally soft and breathable, which is good for baby’s skin and safety. 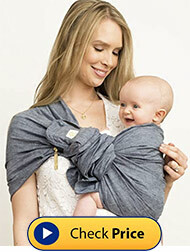 Ring slings are one of the easiest baby carriers for breast feeding on the go. Slings available in wide variety of fabric patterns to fit a parent’s style. Ring slings are easily rolled up and stuffed into a diaper bag for easy packing. Cons: Slings are typically best for newborns and small babies only. 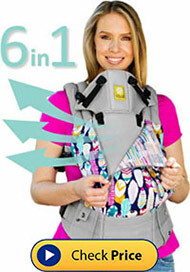 These carriers are completely unstructured; this can cause trouble with baby positioning and safety. The Mayo Clinic warns, “If the baby sling's fabric or your body presses against a baby's nose and mouth, the baby might not be able to breathe. This can quickly lead to suffocation. A baby sling can also keep a baby curled in a C shape, which increases the risk of breathing problems.” Parents may also experience neck and back discomfort from the one-sided strap position. What to look for: Parents should be aware of variations in sling “tail” length will vary between brand and style. Slings with shorter tails can pose safety issues for plus-sized parents, as a generous slack is necessary to securely fasten the device to hold baby. Parents should also consider ring material (typically wood, plastic, or metal) and whether the sling is machine washable/ dryable. Ring slings are available in many fabric choices, so parents with summer babies may consider lighter fabrics, while parents of winter babies would prefer warmer, more protective fabric options. Wraps are another soft fabric option for baby wearing. These devices are often fashioned as a single piece of fabric that is intended to fold and wrap around the wearer and baby together. Wraps are a wonderful transitional postpartum tool as they keep baby close to mom’s warmth and heartbeat, and many wrap-wearing moms observe feeling the closeness of pregnancy with baby carried snugly up front. Pros: Wraps are more versatile than slings in that they can be worn in numerous positions—this is especially handy if both parents (or other caregivers) will also be baby wearing. The wrapping strategies offer additional support for the baby, so frequent repositioning is not as troublesome. Like slings, wraps are often available in a range of colors and fabric patterns, and these carriers also fold well for diaper bag storage. Cons: If you thought assembling a crib and a swing was difficult, just wait until you try to use a baby wrap carrier. Some wrap configurations can be complicated, and many wrap users observe the need to practice a few times before feeling comfortable with the process. Some parents may also feel overheated with layers of wrapped fabric. What to look for: Similar to slings, wrap “tail” ends can be very long and will often hang low. When searching for the best wrap baby carriers, parents will want to look for soft, breathable fabrics with a bit of stretch. Stretchy fabrics allow a snugger fit around baby for a safer baby wearing experience. Be sure to check out our list of the best baby wraps. In general, the best wrap baby carriers are made by Boba, Moby, and Solly. Soft structure baby carriers have a defined “seat” for baby and waist and shoulder straps for the parent or guardian. Structured carriers typically include adjustable straps and clip enclosures. Smaller babies within the weight restrictions are worn with their legs tucked inside the carrier; as the child grows, their legs will be repositioned through leg holes or the sides of the device. 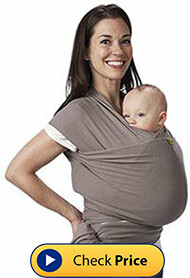 Pros: Structured carriers offer more ergonomic support to both the wearer and the baby. Baby’s weight is more evenly distributed, and weight limits are often higher than those for ring slings and wrap carriers. Soft structure carriers are ideal for lengthy shopping trips and leisurely walks. Buckle enclosures hold positions securely, so frequent adjustments are not typically necessary. Additional features on some models can support longevity of use as the device grows with the baby. Some soft structure carriers include a more versatile design to offer multiple positioning options. Cons: These baby carriers do not conform as closely to babies as ring slings and wraps. For this reason, soft structured carriers are not all recommended for use with newborns. Parents who appreciate the fabric color and pattern options available for ring slings and wrap carriers may be slightly disappointed with the typically neutral style options for soft structure carriers. Although there are some models with a few varieties, the selection is nowhere near that of the flowing fabric carriers. If at all, soft structure carriers do not typically fit well in small or medium sized diaper bags. Because these carriers include specified shoulder and waist straps, there may be sizing issues for some parents or caregivers. What to look for: When exploring soft structure carrier models, parents will want to observe versatility options such as front carry (facing in or out), back carry, and hip carry. There are a few models that also offer a cradle carry structure. Many soft structure carriers have special included (or add-on) feature options, such as sleeping hoods, storage pockets/ pouches, and even infant inserts for safer carrying. In general, the best soft structured carriers are made by LilleBaby, ErgoBaby, and Boba. Also called Hard Structure or Framed carriers, solid structure models feature aluminum framing for comprehensive support and impact ease on the wearer. Parents searching for solid structure carriers will observe a range of options from lightweight to heavy framing. The lighter carriers include slimmer or fewer framing elements. These carriers are perfect for sight-seeing, long shopping trips, and day hikes. Heavier framed options include additional reinforcement to bars and buckles. These carriers may also include numerous pockets, pouches, and clips for additional storage. Parents who spend a lot of time hiking, camping, and exploring will appreciate both the ergonomics and storage options on these durable carriers. Pros: These carriers are extremely durable and are by far the most rugged. They are typically used as a hiking baby carrier because of their rugged construction and excellent support for long-term wear. High quality, solid structure carriers will have a greater longevity for their wear and tear. Due to the structural support system, most framed carriers are able to accommodate substantially more weight than soft structure and fabric carriers, meaning parents will be able to use these carriers well into early childhood. Cons: Solid structure carriers are larger and heavier than other style models, and they tend to come with a heavier price tag, too. These carriers can be a challenge to put on and take off. These carriers can be a challenge to put on and take off. Most framed carriers are unlikely to fit into a diaper bag. Solid structure carriers are not as forgiving with adjustments. Some parents may experience fit and balance issues depending on variable height and frame—this is especially true for petite wearers. What to look for: Outdoor-loving families will search for framed backpacks with ample storage and weather protection features and add-ons. Weight minimums and restrictions will likely have the widest range in this style; so, parents will want to consider the size of their child and how long they intend to use the carrier. 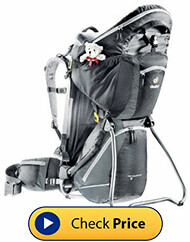 In general, the best hiking backpack baby carriers are made by Deuter and Osprey. Depending on style and model, baby carriers can range in price from $30 to upwards of $200 and above. Ring slings and wraps tend toward the lower price ranges, while soft structured carriers typically cost a bit more. These differences in price will be impacted by fabric quality and device durability. A soft structured carrier is more likely to last through multiple children (so long as the product’s integrity is not compromised). Devices with additional structural support and additional features will have higher price tags. Parents with vastly different torsos and strength may need to consider splitting feature differences if two different carriers are necessary. It is imperative that parents follow age and weight guidelines to ensure safe baby wearing. Many structured carriers require babies be at least six months old to ensure sufficient neck muscle stability. Some structured carriers allow for newborn use or have inserts for newborn support. Ring slings and wraps can typically be used with newborns (when guidelines allow), but parents should ensure a proper fit to avoid suffocation risks from fabric near nose and mouth and improper positioning. The Mayo Clinic warns, “A baby sling can also keep a baby curled in a C shape, which increases the risk of breathing problems. A baby is at higher risk of suffocating in a baby sling if he or she was born prematurely or with a low birth weight or has breathing problems, such as a cold.” Checking guidelines before use supports safe and healthy baby wearing. Mobility: Baby wearing offers ease of movement, whether on a leisurely stroll or bustling through a busy grocery store. Baby carriers allow parents to maneuver with greater ease than strollers through crowds and on various terrains. Hands free: Baby carriers are—for the most part—hands free! Parents may want to keep a hand on baby when safely bending or stretching, but they are otherwise free to work on a computer, prepare meals, complete chores and other housework, shop, etc. Breastfeeding: Breastfeeding mothers will love the flexibility to nurse while wearing baby. This is an option for some fabric carrier models, and will depend on baby’s size, coordination, and willingness. Nursing while baby wearing is more easily accomplished with older babies, and may take practice for both mom and baby. Without a doubt, every baby carrier will be subject to spilled milk or formula, spit-up, and even worse messes. The first question every parent should ask when exploring carrier options is: “How easy is it to wash?” Many of the loose fabric models (ring slings and wraps) will be easily tossed into the washer and dryer. Even soft structured carriers are likely to accommodate washing machine use. However, structured carriers (both soft and hard) will have more seams, pockets, padding, etc. for messes to seep into, creating a more difficult cleaning experience. Some framed models may require partial or full hand-wash only. Ease of Use: Can the carrier be put on safely by one person, or will another set of hands be necessary? Fit: Do the basis width and length measurements fit well to the wearer? How much weight is comfortably carried, and does this align with intended use? Adjustments: Are the straps easily adjusted? Are they secure or do they slip with natural movement and require regular readjustment? Observe the size and placements of clips and ties—are these elements comfortable when secured? Baby Fit: Is the carrier a good fit for baby? This is why it is good for parents to make carrier purchases after baby is born, as weight and coordination varies between each child. This is especially important for parents of premature babies or newborns who have spent some time in intensive care. “Sometimes NICU graduates do not have enough muscle strength to keep their airways open in an unsupported position.” Parents should always check with their pediatrician with any safety questions or concerns. When selecting a carrier, the position of baby’s legs should be carefully considered. Imagine the discomfort of being suspended with legs dangling straight down. Within a few moments, your hips and back become sore, and your feet tingle from poor circulation. According to the International Hip Dysplasia Institute, babies’ joints stretch out naturally over several months after birth. “The most unhealthy position for the hips during infancy is when the legs are held in extension with the hips and knees straight and the legs brought together, which is the opposite of the fetal position. The risk to the hips is greater when this unhealthy position is maintained for a long time. Healthy hip positioning avoids positions that may cause or contribute to development of hip dysplasia or dislocation.” When seated in a carrier, baby’s thighs should be spread around the wearer’s torso and supported to the knee joint, creating a supported position for hips. Selecting a carrier with a wide seat will naturally encourage a healthy position for baby’s hips. Carrying a baby for any length of time can stress back and shoulders. Most soft and hard structured carrier models will include substantial padding for support and comfort, but even some ring sling models include a shoulder pad! Parents will want to consider their personal comfort requirements and inspect possible carriers for comfort adjustments and padding. As parents consider support features, they will also want to observe carrier strap width. Shoulder and waist straps may slightly pucker and roll during use, so it is important to find a carrier with wide straps to facilitate comfort and safety. For safety, parents should only use manufacturer approved accessories with their baby carriers.